Check out our SmartCompliance Cabinets! Click here! Never guess when you need a refill again! Whatever business or size of business you are, safety is key. While some workplaces may be relatively tame others come with inherent risks. So whether you sit at a desk and push buttons or hang from the sides of a sky scraper cleaning windows, a workplace first aid kit is important to treat injuries that will occur. 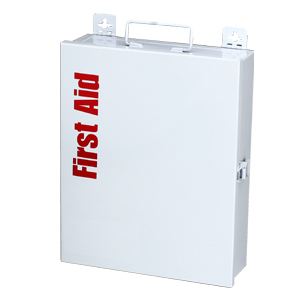 Office building or construction site people will get hurt and a well stocked workplace first aid kit enables individuals to respond to the emergency quickly.